Designability is a national charity joining expertise and knowledge to enhance the lives of children and adults with an illness or disability. Our designers and engineers research and produce assistive technologies that help to make a real difference. We advocate better technology for everyone. And believe inclusive design is the only way forward. So we work with end-users, carers and health professionals to help us understand the problem, find a solution and test it in real life situations. We create great looking, easy-to-use products that go beyond basic functionality. And we partner with industry to help as many people as we can – we’ve transformed over 250,000 lives in the last 46 years. 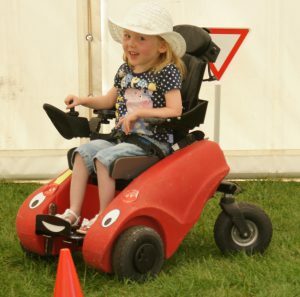 Our work includes Wizzybug – the fun and innovative powered wheelchair for kids under 5. Generally there is no NHS funding for powered mobility for children under 5 so we have to fundraise to make Wizzybugs available. Thanks to the generosity of our donors, we are loaning our Wizzybugs for FREE to children in mainland UK who could benefit from them. Families can have a Wizzybug for as long as the child can benefit (this is usually until they outgrow it) and when they have completed their loan, they return their Wizzybug and we refurbish it for another family.